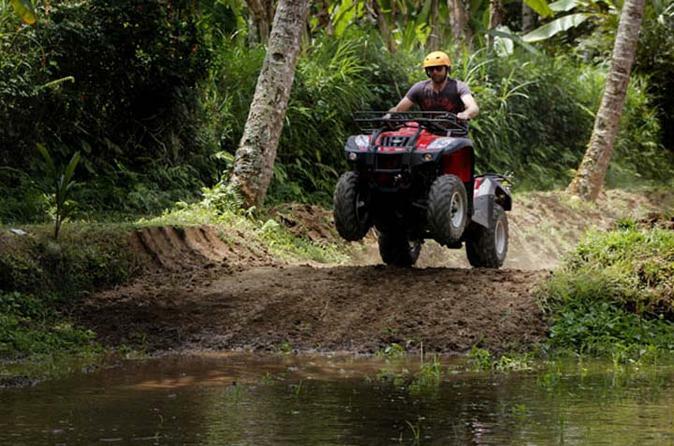 This Ubud ATV Ride and Ritual Bathing at Tirta Empul Temple tour is a unique way to explore the beauty of nature Bali has to offer. The journey begins with a 2 hour exciting ATV ride on the beautiful Balinese landscape followed with having Indonesian buffet lunch afterwards. The journey then continues on to ritual bathing at Tirta Empul Temple where many Balinese purify themselves. At the end of the program you will visit luwak coffee plantation to taste local coffee blends. A very active temple built on the holy spring , Tirta Empul is very interesting to observe the Balinese purifying them self by means of ritual bathing. This tour program already includes the appointment to do the Ritual Bath as the Major Balinese do . Free Sarong also included and must be worn before getting into the pools. Great opportunity to see the local Balinese make local coffee combined with other spices, including the most expensive coffee "coffee luwak". Coffee luwak is made from the coffee beans that have been eaten by the civet cat, not actually digested, collected and cleaned, roasted and ground it for your coffee drinking pleasure. Free tasting also included on the program, however any purchase of the spices/coffee is at your own expense.